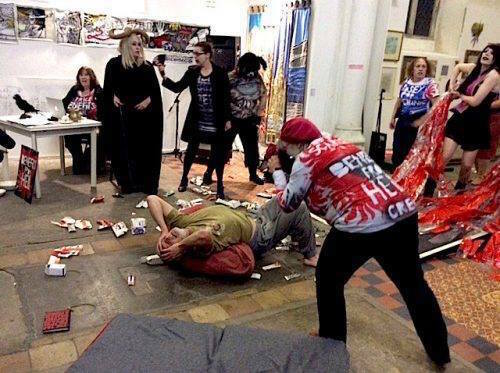 A VERY Queer Nazi Faust, an experimental participatory performance created by Norfolk-based poet, artist, and disability rights campaigner, Vince Laws, highlights the plight of disabled people under the current Tory government. It was cast via social media and performed to great acclaim at Norwich LGBT+ Pride in 2017. 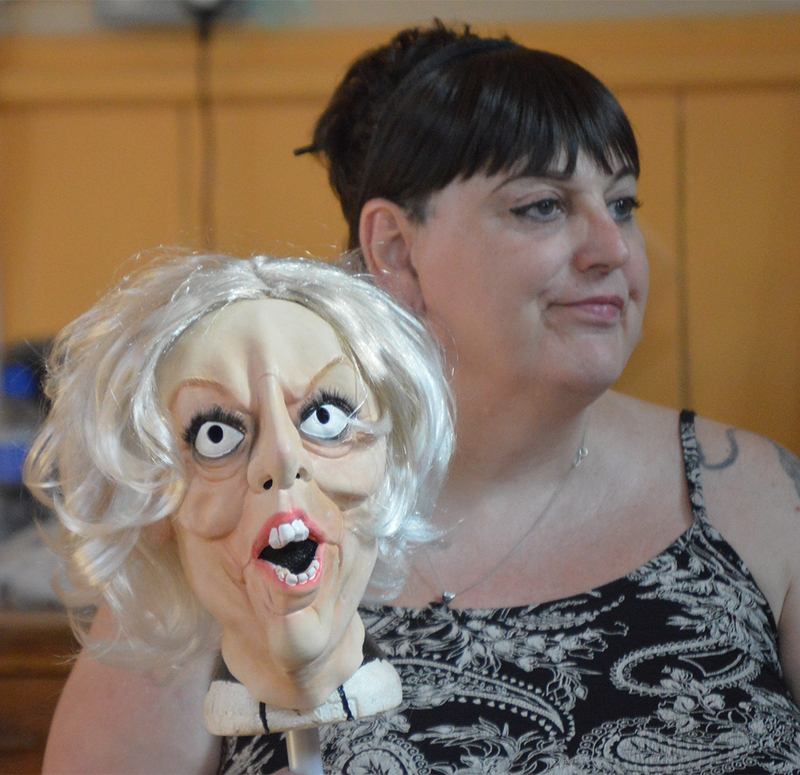 Funded on a shoestring, starring thirteen local legends and the DEAD PEOPLE DON’T CLAIMbanner, the piece was performed to great acclaim at Norwich LGBT+ Pride in 2017. 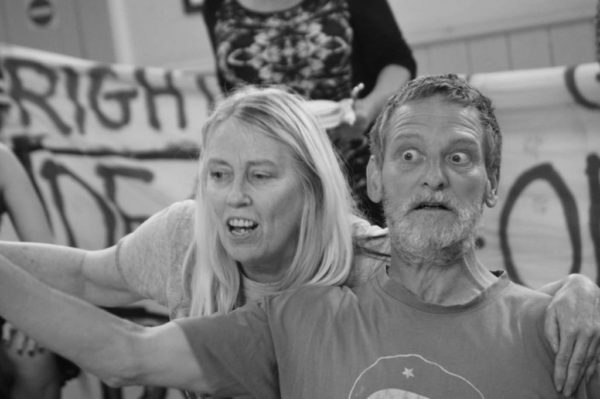 Now, with support from Unlimited, who support ambitious, creative projects by outstanding disabled artists and companies, there will be participatory workshops at Silver Road Community Centre in central Norwich during summer 2018, culminating in a special one off performance at the Norwich Arts Centre on Wednesday, September 12, 2018 at 8pm. Poet John Faust is suicidal. His benefits have been stopped without warning, the bailiffs are due to evict him, his dog is in the vets dying, his car needs a new clutch, and he can’t finish his poetic masterpiece while the voices inside his head torment him. In despair, John throws himself off Beeston Bump, Norfolk’s highest peak, clutching The Tragic True Life & Deserved Death of a Benefit Scrounger written by himself, but Lucifer won’t let him drown because she loves his book and wants a bigger part. A Very Queer Nazi Faust highlights the plight of disabled people under the current Tory government, described as “economic murder” in the British Medical Journal, and as a “human catastrophe” by the United Nations. The performance contains adult themes and language, suicidal thoughts, Lucifer, The Naked Abseilers and poetry, but no Nazis. Support from Unlimited will enable text projections by Andrew Day for greater accessibility, and a soundscape created by Dandelion Snowley. The workshops and performance may be photographed, filmed and live-streamed. Commissioned and supported by Unlimited, celebrating the work of disabled artists, with funding from Spirit of 2012. If you need help to take part, let Vince know, he’ll do his best to make it happen. Posted on August 6, 2017 by Norwich Radical in Arts and tagged A Very Queer Nazi Faust, activism, disability, Disability Arts, Dr Faustus, Faust, norwich pride, Norwich Pride 2017, performance, poetry, protest, Protest Art, queer, Vince Laws. Photo by Alan Brooksby, the Faust cast in action at the launch of Dandifest, 2017.